We continue to explore the Unity 4.6 GUI system. In one of our previous posts, we learned about How to Create a Level Select Scroll Menu. In this post, we will use this foundation we have set, to build a Level Lock / Unlock System. If you have followed the Level Select Scroll Menu, you would have a scene named Level Select, of course you don't need to have the exact same Menu, in fact, any menu with some Level buttons would do. Make sure, you name the scene as World1, as we would be using this name in our code. 1. Import an image to indicate the Locked status of the levels. Either you can design it in photoshop, or search the internet. If you wanna follow along this post, then, download the image below and copy it into your project. 3. Now, duplicate the Level2 button by pressing ctrl+D. Rename it to LockedLevel2 (The name means a lot, as we would be using it in the code as well). Delete the Text component of the button. 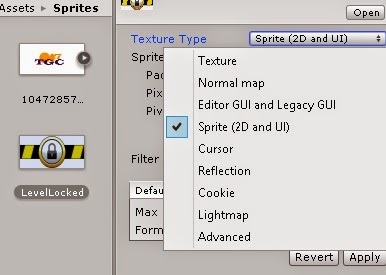 Add the Sprite you just added to this Button's Image Source Image field. Change the alpha value to 255 so that we don't have a transparent sprite. Also, change the Transition of the Button(Script) component to None as we don't want it to be clicked and neither we want to have any effects of it being clicked. 5. Create a new C# Script named LockLevel. Open it and add the below code to it. In the above code, we simply set the PlayerPrefs of the Levels to 0. If it is the Level 1 of World 1, then we set the value of Level1:1 to 0. 6. Create a new C# script named LevelSelectScript and attach it to the Main Camera. Double click on the script to open it. The above code checks which all levels are locked in a particular world. If a particular level is not locked we disable the LockedLevel buttons so that we can see the real Level buttons beneath them and click on them to start that particular level.Comment below if you have any questions about the script. 8. Repeat this to all the Level buttons and send their respective values. 1.2 for level2, 1.3 for level3 and so on. 9. Save the scene and create a new scene named Level1.1. Add a cube object, position it at (0, 0, 0). Rename it as Player. Add a Rigidbody component to it. Uncheck Use Gravity checkbox of the Rigidbody. 10. Add another cube and name it as Goal. Position it at (5, 0, 0). Check the Is Trigger checkbox.of the Collider component. Add a directional light if you need. 11. Create a new C# Script named PlayerMovement. Add this to the Player object. This scene is basically to demonstrate the working of the level unlocking system. Open the script and add the below code to it. The code above gets input from keyboard to move the Player cube and moves it accordingly. Use the left and right arrow key to move the key and reach the Goal. Once the goal is reached the next level is unlocked. To verify this we load the Level Select scene i.e., World1 scene. This is pretty much it. We have developed a Level lock / unlock system using the all new Unity 4.6 GUI and the classic C# scripting. - Name the level select menus as World1, World2 and so on. - Name the game levels as Level1.1, Level1,2 for levels one and two of world one respectively. - If you have a Main Menu, attach the LockLevels script to the New Game button so that it deletes all the PlayerPrefs keys. - If you want to give the option of Continue, do not use this script as it deletes all the PlayerPrefs keys. - Make sure you add these levels in the Build Settings for them to switch scenes on click of a button. but I have no idea when adding world1, world2, world3 to make it unlock/lockable. can you send me sample project for that? thanks! Great tutorial. I would like to see a 3 star rating system based on this logic. Can you make such a tutorial in order to have a more complete solution? Thank you ! Works perfectly ! That's great! Thank you so much! one question about extending functionality, how can I create 2 buttons in World1 scene, which according to from which level i enter into World1 scene, would sent me to this level again, and to the next level. For example " I go to World1 from level 5, and i want to go to level 5 by Retry button, and go to level6 by Next Level. Well, there is a LockLevel script which does this. As you have not attached this to any game object, it is not involved in the game when you build it. Maybe you can attach it to the MainCamera or something else in the very first level so as to lock the levels. Of course, you don't want to lock the levels every time this level is come across. Maybe you want to turn off the component/script when not required. what this script work in 2D game? Erorr building to mobile platform. Can you help me, how to resolve this issue? Well.. I'm not sure how your scenes are setup. Say, I have a Main Menu scene from where I move to the World1 scene. This Main Menu has a main camera which has LockLevel script attached but is not active. And I have two buttons say New Game n Continue Game. Now, if I press the Continue Game button the LockLevel script should remain in disabled state. If I press the New Game button, make the script active before you move on to the next scene. Once this is done, the levels should be locked except the first one. What would be the best way to record the best time and output it to a UI text on the level select? Hello! 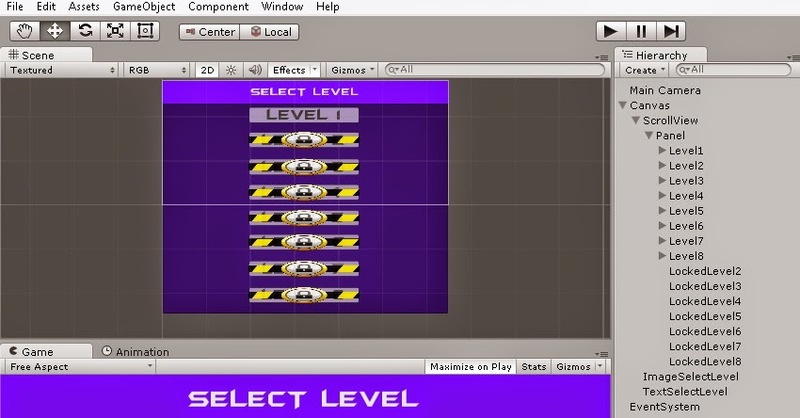 Thank you a lot for all your tutorials :) I'm a begginer on Unity, i do this tuto but i want to add a button in my "MainMenu" scene to load the higher unlocked level, how i can do this please ? In the note you say "If you want to give the option of Continue, do not use this script as it deletes all the PlayerPrefs keys." Also would the deletion of PlayerPref create problems with in game saved checkpoints? why the span is error? Is there any video tutorial? Or please explain to me further because I'm really confused where should I name the level1.1 and World1. Please Help me. Thank you! I really Appreciate! I really need this to my thesis. Hello Mr. Sujit thank you for this tutorial , it helps me a lot but i have a problem regarding on locking levels . Once I unlock a level it cant be locked again .how can i fix this? . I have error about "GameObject.Find("LockedLevel"+(j+1)).active = false;"
Hi there!I did everything you wrote in this tutorial and it worked at first but then when i went back from level1.1 to World1 things got messed up.Is there a way you could help me?Like can i send you an e-mail describing what changed when i loaded the World1 scene again and also send you a copy of my project?If you have time of course otherwise i just need help fixing all these broken from the scripts(probably) things!Thanks! It worked. Thank you for the tutorial. Great one! How can i use more than 1 world ?? can you please post video for this? It is not working on android.. after finishing 1st level.. 2nd level is still locked..
Change the number of levels in the LevelLock script . sir my game is a quiz android app could i use your code of lock and unlock level??? thx man it works very well, even to reset the lock system its pretty easy. How did you reset the lock system?! 7---- should i add camera on levelLocked buttons and give similar strings to them as respeect to their levels?